Well I finally got the pictures taken and a few minutes to show you how to make these cute and easy ornaments. What you will need is some snowflakes, I got mine at Dollar Tree (yeah Canada now has Dollar Trees), these came 10 in a pack and they have glitter on them but there are several varieties to choose from. 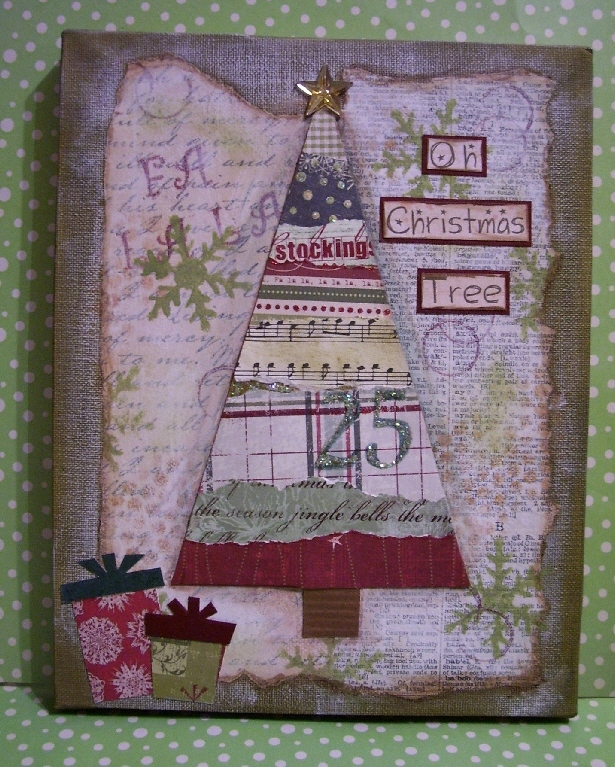 You will need scissors, a circle punch, mine is 1", hot glue gun, vintage or even small images from past Christmas cards, a strip of 12 x1 inch paper strip and a small square for the back of the rosette you will be making from the strip. Take the 12x1 inch strip of paper ink the edges and then score it every 1/4 inch, then accordion fold it to the end. Attach the ends together making sure your valley folds and peak folds line up the glue in place. Now press the circle down and push it in to form a rosette like shown below, you actually need 3 hands at this point but don't get discouraged it is well worth it in the end. The side you want face up on your snowflake lay face down for now. Get your square piece of paper and hot glue gun. Made sure you work on a surface that you won't damage with hot glue, a non stick mat or whatever you are using. Squirt some glue down into the hole then quickly take that square piece and place it over the hole. This will help keep the rosette together. I usually have my hand on the rosette but this was all done so I could take the picture to show you how it looks on the back side. Flip over and now you have a rosette. Vintage looking isn't it...now for the fun part. Add some hot glue to the piece of square paper on the back, stick to the center of the snowflake. 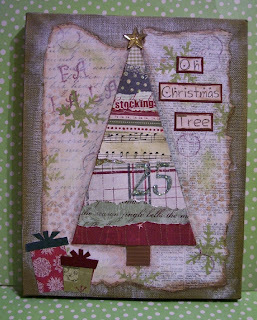 Add your image to the top and any more little embellishments you like. These images are found around the net copyright free. Make sure your hanger is at the top before gluing everything in place. I have done a few of these with little children's faces from Magic Moonlight site and some from FlickR etc. Use your children's faces, pictures from old photos, old postcards, past Christmas cards with tiny images. Add to packages or hang on the tree. Ornament exchanges, swaps etc. So easy and even the kids could help. How easy and frugal and they look so nice. Good craft show sellers as well, believe me they sold!!! And this 8x10 canvas I taught a class at my community library on Thursday night during the 12 weeks of Christmas craft nights. It was inspired by the talented mixed media artist Christy Thomlinson and we had a blast. The girls really enjoyed this and we used, paints, stencilling, text pages, scraps of Christmas papers, water colour crayons and fonts from the computer. Each girl used different papers and loved using sequin waste for the first time and were amazed at how easy and effective this was. I even gave them an extra canvas to take home and make another on. It was a small class and we had a blast. A good time was had by us all. Stay tuned for our next Christmas quick tutorial. Will go on the hunt for some snow flakes here and the canvas is just stunning. Thanks for sharing all your ideas and how toos. love the snowflake rosettes-love all things vintage!..I too bought those snowflakes at dollar tree 2 weeks ago and they were down the last 5 packs!Your project made me wish I had bought more! They are very gorgeous and I will have to scrounge up the ones I didn't use and make some of these even though I shall probably burn myself! THe little ornament is so cute, Lesley! Love those dollar tree snowflakes! The canvas is nice too! Great job on all! Another couple of sweet ideas! For the last few years I have done some holiday crafting between Christmas and New Year's for the next year, these are going on my list!